A step-by-step guide from U-GameZ! Please note that this guide is just for the first game in the Error Ware series, in Error Ware 2 it's much easier. For an EW2 guide click here. Note: these instructions are for Windows 7, should work similar with XP! Note: To use the Wii Remote Pointer as the mouse cursor, you will need to place a Wii Sensor Bar underneath or at the top of your PC Monitor. You can buy wireless (= using batteries for power) Sensor Bars for a few bucks. For trying purposes, you can use the original corded Wii Sensor Bar, but then your Wii has to be powered on all the time, and your Remote may connect to the Wii instead of your Computer. If you´re ready, make sure your Bluetooth device is plugged in and active (you should see a little blue symbol at your taskbar). Open GlovePIE and load the .PIE file for the game (see below), then click the "RUN" button in GlovePIE. Right Click the Bluetooth symbol in your taskbar or type in "Bluetooth" into the search field of the start menu. Then click on "Add a Bluetooth Device". Windows 7 will begin searching for discoverable Bluetooth devices. Press the 1 and 2 button on the Wii Remote at the same time, and keep doing this every few seconds until the process is complete. Within a few seconds, the Wii Remote will show up in your "Add a device" dialog in Windows 7. It will appear as Nintendo RVL-CNT-01. With the Nintendo device selected, click Next. Windows will now install the drivers to interface with your Wii Remote. Sometimes, the Bluetooth connection is lost before Windows can finish installing the drivers, then try again and make sure you press the 1 and 2 buttons to keep the remote blinking. Once your Wii Remote is successfully installed in Windows 7, it should be soon recognized by GlovePie. Make sure to load and run the .PIE file (wich contains the control script for that specific game; download them below) before you start installing the Wii Remote. Otherwise it might not be detected correctly by GlovePie. After a few seconds, your Wii Remote should stop blinking and instead show the indicator for Player 1. 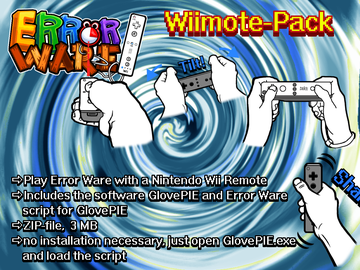 Now you should be able to use the Wii Remote in the game Error Ware. To see if it works, turn on your Sensor Bar and point the Wii Remote towards it. You should be able to move the mouse cursor with your Wii Remote, as well as use the A button for the left mouse button. Stop the GlovePie script (your Wii Remote should turn off) and start the game. Let it load and click the "Run" Button in GlovePie again, when the game starts. You can minimize the GlovePie Window now. In the game´s title screen, choose Wii-Remote controls and have fun! Please don´t worry if you can´t get it to work. Maybe your Bluetooth device just isn't compatible with your Wii Remote, or you need special drivers / software (like Widcomm or BlueSoleil) to make it work. There are many websites about this topic, just waiting to help you. Our Wii-Remote support is just an optional gimmick, you can have as much fun with the games just using your regular keyboard and mouse!